Is There a Treatment Program for Tranquilizer Abuse? Are Tranquilizer Rehabs Private and Confidential? How Long Does Inpatient Tranquilizer Rehabilitation Last? Tranquilizers are specific types of medications that are sometimes used in the treatment of anxiety or for sleeping problems. These medications work by producing a calming effect throughout the central nervous system. According to the FDA, an estimated 6 million people have reported using some sort of psychotherapeutic drug, including tranquilizers. Although tranquilizers are a commonly used prescription medication, the risk of addiction can be high. When an individual frequently uses tranquilizers, the result can be an increased tolerance level requiring larger doses to achieve the desired feeling of euphoria. 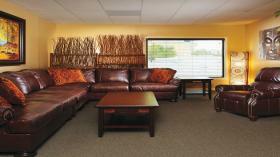 A tranquilizer rehab center provides treatment services to assist individuals who are addicted to tranquilizers. If you feel you or a loved one may be addicted to tranquilizers, it is important that you seek help from a specialized tranquilizer rehabilitation center. There are two primary types of tranquilizer rehabilitation facilities available: inpatient and outpatient. In deciding which type of treatment facility is best for your needs or for those of your loved one, it is important to understand that an inpatient facility will provide care and services around the clock while an outpatient facility will typically only provide care during the day. Use Our Contact Form or call us anytime at 1-888-341-7785 if you or someone you know is searching for an inpatient tranquilizer rehab facility to get in touch with an advisor who can help. ...an addiction can form when one goes from using the medication as intended to abusing it. -Rehabs.com Many people often wonder whether they or their loved one really needs to attend a residential rehab center in order to overcome an addiction to tranquilizers. An addiction to tranquilizers can include a compelling need to take increasingly larger doses of the medication. Although tranquilizers have their benefits, an addiction can form when one goes from using the medication as intended to abusing it. It is quite common for many people to have questions regarding what to expect when they enter a tranquilizer rehab center. Many types of tranquilizer rehabilitation programs exist, including exclusive, private facilities that offer not only private rooms but also private living areas. Regardless of the type of tranquilizer rehabilitation facility you enter, you can be assured of complete confidentiality regarding your treatment. It is never too late to take the first step toward a new beginning, free from an addiction to tranquilizers. To find a tranquilizer rehab facility near you, please contact 1-888-341-7785. Another of the more common questions asked by prospective patients or family members of individuals with tranquilizer addictions is in regard to how long they can expect the treatment to last. The duration of an inpatient tranquilizer rehab center treatment program can vary. Some treatment programs last only 28 to 30 days. There are also 60- and 90-day treatment programs available. Longer treatment programs may be more appropriate based on the severity of the addiction. Other options include outpatient treatment services, but it should be understood that the services of an outpatient facility may be limited compared to those of an inpatient program. The first phase of the treatment process at a tranquilizer rehab facility is intake. This phase is of crucial importance as it helps the medical staff at the facility analyze the patient's individual needs. Specialized detoxification services will also be provided to help purge the individual of the tranquilizers in their system. The detox phase will assist the patient in managing withdrawal symptoms. Other services will also be provided at a tranquilizer rehab center and may include addiction therapy, cognitive behavioral therapy, motivational therapy and specialized care. Extended care and aftercare will also be provided to help the patient make a smooth transition following release from the tranquilizer rehab program. For individuals and families concerned about the cost of a tranquilizer rehab center, it is important to know that there are many affordable options available. Not only do rehab programs vary in cost, but many tranquilizer rehabs accept insurance. Financing programs are also often available to ensure affordable treatment for all budgets. This is a common question for many people searching for a tranquilizer treatment facility. There are treatment facilities located all over the country. The decision of whether you should remain near home or travel depends upon personal preferences and needs. Call 1-888-341-7785 to discuss options and find a treatment facility that is right for your needs. Many modern addiction treatment centers offer the luxury amenities one would normally enjoy in the nation's finest hotels, with your success and comfort being the top priorities. From private rooms and 5-star chef-prepared meals to fine linens and gym facilities, you can get the best substance and behavior addiction treatment for yourself or your loved one while relaxing in style. If you need a hand in finding the greatest luxury treatment facilities for addiction to tranquilizers, call our toll-free helpline today at 1-888-341-7785. A professional tranquilizer rehab center is dedicated to helping patients achieve success not only during treatment but also after they leave treatment. Toward that end, treatment facilities provide patients with a variety of tools and coping mechanisms to assist them in staying sober. It is never too late to overcome any type of addiction, including an addiction to tranquilizers. Even so, you or your loved one must be ready to take that first step toward a brighter future. You must be ready to accept that a problem does exist and ask for help in overcoming the addiction. It can often be difficult for many people to accept that they have developed an addiction to a controlled substance. It can be particularly difficult when the substance is a prescribed medication, such as tranquilizers. This is why an intervention is often necessary. Following an intervention, a qualified tranquilizer rehab center will handle a comprehensive assessment and then assist the patient through a detox program. If a residential rehabilitation program is selected, the patient will reside at the treatment facility for the duration of the treatment. In an outpatient facility, the patient may attend various types of treatment programs, during the day only. Various types of treatment methods are available, including spiritual, non-spiritual, faith-based or 12-step, and holistic treatment programs. A comprehensive tranquilizer treatment program will also include assistance regarding sober living and aftercare for a full recovery. No matter how dark things may seem at the moment or how long you or your loved one has battled a tranquilizer addiction, it is never too late to completely turn things around at a tranquilizer rehab center. You can look forward to a future that does not rely upon tranquilizer dependence. What are the slang, street names, or nicknames for tranquilizers? Am I addicted to tranquilizers? What are the long-term effects of tranquilizer abuse? According to the Institute for Substance Abuse Treatment Evaluation, a research initiative project, long-term effects of tranquilizer use may include extreme depression, cerebral atrophy, memory loss, and increased aggressiveness.